Korean War veteran, Harold E. Bean, at left, with Vietnam veteran Charles ‘Chuck’ Divelbiss during Sunday’s Memorial Day service. Placing wreaths at the Victory Shaft during Veterans Day program on Sunday. 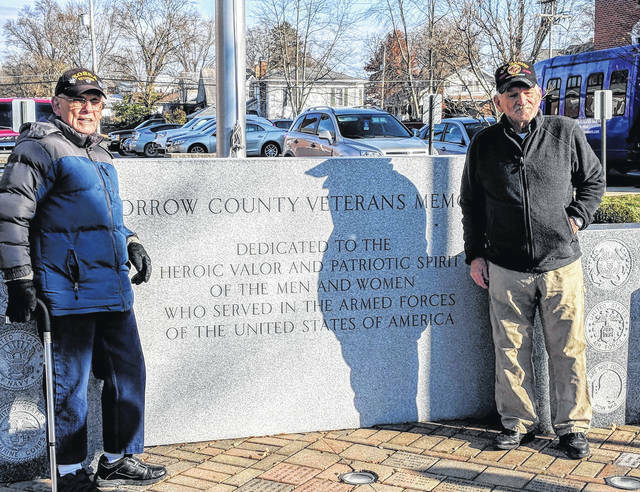 Veterans, from left, John Shade, Steve Cole and speaker Frank Hickman, who spoke at the dedication at the Morrow County Veterans Memorial Sunday. 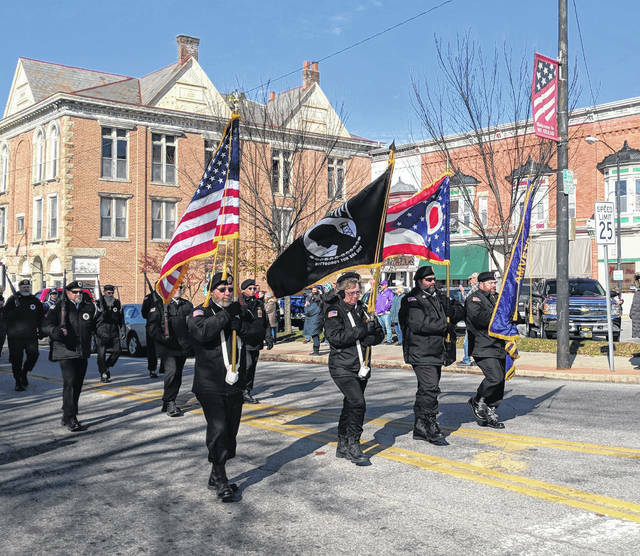 The color guard and firing squad enter the Mount Gilead Square at 11 a.m. on Nov. 11. 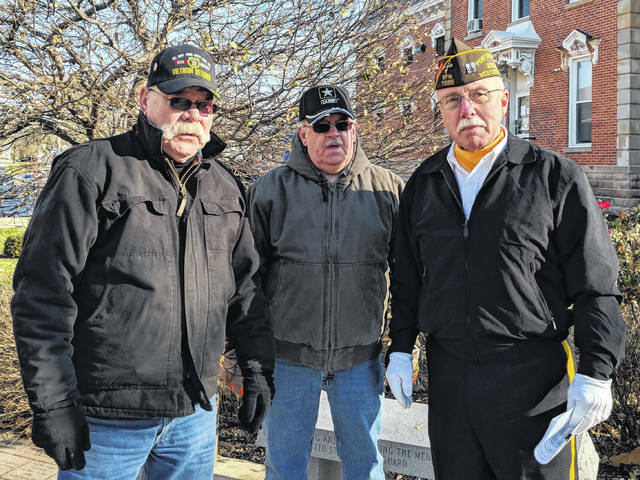 MOUNT GILEAD — There were tears in the eyes of several veterans and family members as names of loved ones were read by the speaker, Frank Hickman, at the ceremony where memorial bricks were dedicated for 17 veterans. Memories of service were shared and Chuck Divelbiss talked about his worst day in Vietnam in 1968 when he was in charge of a rifle unit and lost 61 men that day. Veterans dedicated memorial bricks at a Sunday morning memorial service at the Morrow County Veterans Memorial. The Color Guard and firing squad were present along with the families and friends of veterans for whom bricks were dedicated. 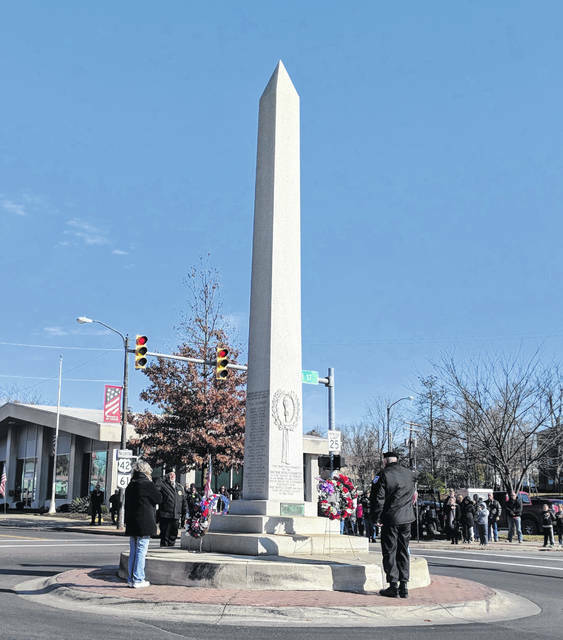 The dedication was part of the Sunday Veterans Day services commemorating the 100th anniversary of the 1918 Armistice that ended World War I. Veterans honored include: Wilbert Arons, Albert F. Bean, Charles E. Bean, Donald Bowman, Adam Bradford, Robert M. Curts, C.L. Ferrington, Ernest L. Hoam, Claude M. Likins, Wayne E. Lust, David Rinehart, Ernest Rinehart, Lowell Rinehart, Robert Vaughn, Carla Warner and Robert Willeke. A Color Guard and firing squad also honored veterans at Rivercliff Cemetery in Mount Gilead at noon Friday. Hospice Chaplin, Jeff Slider spoke to honor the memory of all who gave their lives and thanked veterans who were present for their service and sacrifice. Veterans were welcomed at Seniors on Center in Mount Gilead where lunch was served for 100, which included 55 veterans, their spouses and family members. Entertainment was enjoyed with the band “Kickin’ Grass.” Activity Director for the Senior Center, Chris Willford, thanked sponsors: Chester Arbor Gleaners, First Federal Bank, First Knox National Bank, Fricke’s Auto and Truck Repair, Lubrication Specialties, Inc., Maceyko Tax, Inc., Mary K Florist, Morrow County Dental, LLC, Seniors on Center, Tammy Willford and Whetstone Industries. Veterans received a card and cup holder from Whetstone Industries, along with a certificate of thanks for their service from Seniors on Center. Mary K Florist provided a patriotic centerpiece for each table.